With a surplus of blood oranges on hand from a recent purchase of five pounds worth through localharvest.org, I decided to use a couple of these bad boys to make what turned out to be one ridiculously delicious smoothie. It was pretty healthy to boot, which is always my chief aim when making a smoothie. The fruit in this smoothie combine to pack it full of potassium, dietary fiber, vitamin C, beta carotene, folate, magnesium, iron, and vitamins B1 and A. It’s also very rich in antioxidants. 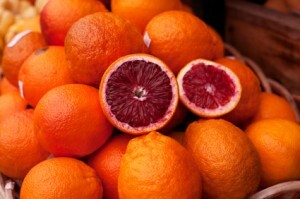 The blood oranges I got are a dark orange on the outside and a vivid red on the inside from the powerful antioxidant anthocyanin. The basic version of this smoothie doesn’t call for any greens, but I went ahead and added 2 cups of fresh baby spinach turning this into a green smoothie. As always, feel free to tweak the ingredients however you’d like. Toss the ingredients into your high speed blender and blend for 30-45 seconds or until the desired consistency is reached. Try this recipe or one like it? Please leave a comment below and tell me all about it. Happy Blending! Had an orange I wanted to put in a smoothie and came right to your site to get an idea for ingredients to add in. Love that I’m able to search your recipes by fruit. This was delicious! I’m so happy to hear you’re taking advantage of searching recipes by ingredient, Janet. I figured this page would come in quite handy. Oh, and great to hear you enjoyed this smoothie.